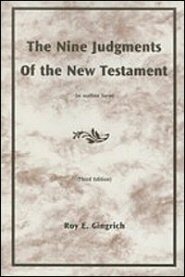 The Nine Judgments of the New Testament include judgments of individuals and nations. At all of these judgments, Christ is the Judge, for since the cross of Christ all judgment has been committed to the Son, John 5:22, for in His earthly life He proved Himself worthy of being appointed Judge by always judging in perfect harmony with the Father. This commentary gives us a view of the overall plan of God, the plan of the ages, and it helps us to find our place in this plan. As we read the book we see that some of God’s judgments are history, some are current, and some are yet to come.